1Open the image in your photo editor and choose File→Save As to make a copy. By making a copy, you save the original formatting of your image file in the original. 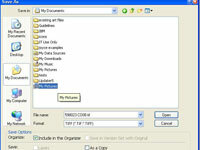 2In the Save As dialog box that appears, give the file a name, select the storage location, and select TIFF as the file format. 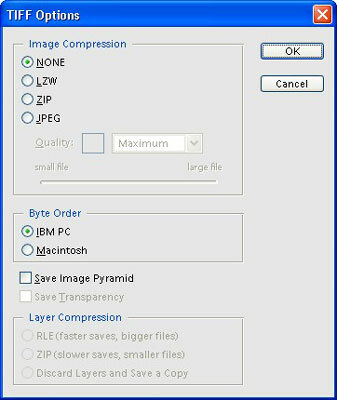 Decide where you want to store your TIFF copy of your file in the Save As dialog box so you can find the image later. 3If your file contains layers, select the option that merges all those layers into one. Many programs can’t open layered TIFF files, so merge all the layers in your TIFF copy. A new dialog box appears with some additional options. These options vary, depending on the program. This figure shows the TIFF Options dialog box from Photoshop Elements. 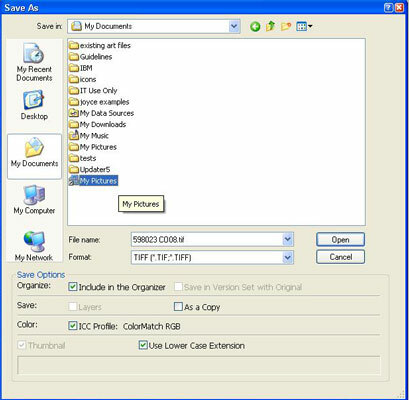 5Set the format options for the widest compatibility. Your editing program’s Help section can explain what settings it offers. 6Click OK to complete the process. Your original file closes, and your TIFF copy appears on-screen. Unless you want to make further changes, just close the image.